Palm Springs, CA – The Palm Springs POWER were able to come back from a 3-1 deficit after the second inning and beat the Novato Knicks in the bottom of the ninth inning by a final score of 4-3. However, the POWER did start the first inning with a run and scored another run in the third inning. The POWER bats fell silent from the fourth inning all the way through the eighth ninth. Then in the ninth inning the POWER rallied and surged to life. The inning had the makings of a comeback after a walk and error that led runners on first and second with no one out. After a passed ball that allowed the runners to move to second and third, pinch-hitter Marcus Romero was intentionally walked. Centerfielder Brett Christopher took a bases loaded walk that tied the game. 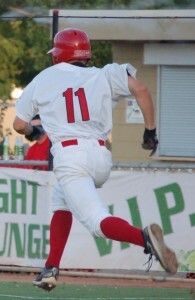 Ricky Gingras came into the game as a pinch-hitter and drove the first pitch he saw between the first and second baseman for the game winning hit. The winning pitcher for the POWER was Bryan Dalton who went four innings allowing only two hits and striking out three for the win. Brandon Kizer started for the POWER and went one and two-thirds innings allowing two earned runs while striking out four. The other POWER pitcher was Dustin Ispas who allowed one hit and struck out one while going three and a third innings. The POWER return to action Saturday night against the Novato Knicks at Palm Springs Stadium. Saturday marks the annual Bike Night at Palm Springs Stadium, featuring a parade of motorcycles prior to the first pitch. Fans should also be aware of the POWER game on Sunday, July 4th that will feature fireworks after the game. The game starts at 6:05 PM and the gates open up at 5:00 PM.